Craig Parkhurst and our new National Sales Manager, Kenny Campbell, will be available at the Fort Lauderdale International Boat Show Nov 3-5th to provide persona demonstrations of our maintenance program as well as to answer questions on maintenance management. Please contact our office at 978-562-5211 x2 to schedule a meeting. The city of Boston, MA has selected WheelHouse to provide a maintenance management program with Turnkey Implementation for their fleet of three vessels This implementation included vessel walkdowns to gather information on installed equipment; development of a document repository; compiling maintenance guidelines; and providing spare parts recommendations. The City of Boston Marine Units fleet consists of three vessels including a 70′ SeaArk, a 30′ Ribcraft; and their newest vessel is a 32′ Armstrong. The SSV Oliver Hazard Perry, which is the largest civilian sailing school vessel in the US, recently completed all requirements to qualify with the USCG as a Sailing School Vessel. She is now underway with the first class of trainees on an 11 night adventure around New England. The three-masted, full rigged ship carries 14,000 sq. ft. of sail and seven miles of running rigging. WheelHouse Technologies was chosen by OHPRI over a year ago as a tool to ensure the safety, reliability, and longevity of the vessel and we have enjoyed working with them on this project and congratulate them on this recent milestone. The Port of Long Beach recently welcomed the first of two new state-of-the-art fireboats into service recently. “Protector” is equipped with 10 water cannons with a total capacity of more than 41,000 GPM and has the capability of shooting water 200 yds and more than 65 yds high. She can also assist with chemical, biological, radiological, and nuclear threats. In an effort to ensure the safety, longevity, reliability of their vessels, WheelHouse Technologies was chosen for these vessels along with the remainder of the Port of Long Beach Fleet. WheelHouse Underway App won the 2015 Horizon Silver Award in the Best Mobile Apps – Business Category. This is a fantastic honor as the Horizon Award is one of the leading International Media Competitions with over 1100 entries from 21 countries around the world. The Horizon Interactive Awards, now in its 14th season, has become one of the most prestigious awards in the field of interactive and creative media. WheelHouse Technologies will be exhibiting at Trawler Fest, which is PassageMaker’s stand-alone series of boat shows, specifically designed for cruising enthusiasts. Strategically located in key cruising regions nationwide, TrawlerFests feature an impressive in-water selection of new and pre-owned cruising powerboats, first-class education and demonstrations, the latest in marine products & services, and opportunities to share cruising adventures with fellow cruisers, industry experts and your favorite PassageMaker editors. Join us May 17-21 for Seminars & May 19-21 for In-Water Show Portion of TrawlerFest in Anacortes, Washington, for the second TrawlerFest stop of 2016 as we head to the Pacific Northwest! 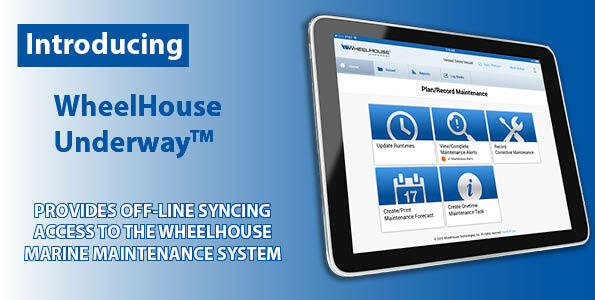 WheelHouse Underway™, an off-line tablet application for Apple™, Android™, and Windows™ devices was released late last year and now available for fleets. 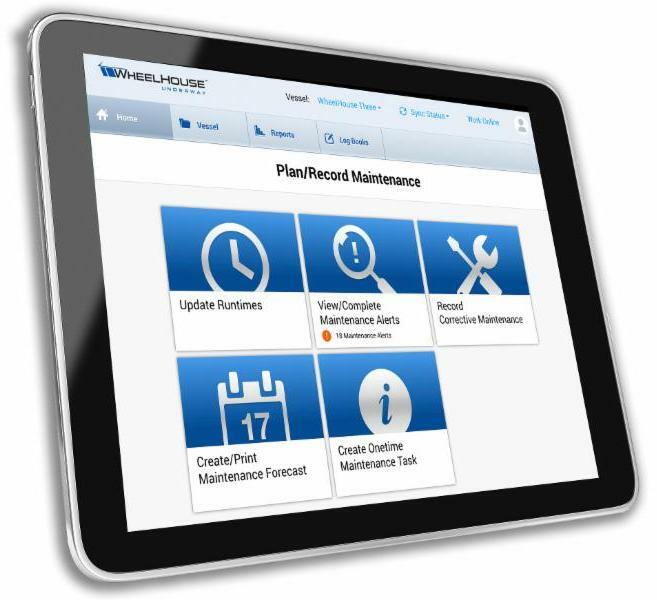 WheelHouse Underway expands the functionality of the WheelHouse Marine Maintenance System, which provides: vessel specifications, documentation, maintenance recommendations, and spare parts guidelines in a cloud-based application. WheelHouse Underway provides the long-awaited off-line access to WheelHouse allowing customers a convenient way to view equipment information, documents, as well as enabling users to view and complete maintenance tasks when an internet connection is unavailable. Once an internet connection becomes available, all information may be synced back to the cloud. WheelHouse Underway takes advantage of both tablet and cloud technology and provides a user friendly application even when internet is unavailable. With internet access limited in remote areas, you and your crew will find WheelHouse Underway an indispensable tool to keep maintenance and spare parts inventory current. Underway. If you are interested in adding this off-line functionality to your fleet, please contact usfor a demonstration, feature review, and pricing. All information may be completed off-line and synced at your convenience. Dynamically update your engine runtimes while at sea to determine upcoming maintenance. Runtimes will sync with the cloud when internet is available. Preventative and onetime maintenance tasks can be completed. Onetime maintenance tasks can be created and corrective tasks can be completed. All information is saved on the device until synced with the server. In addition, on-board parts are also automatically removed from inventory when synced. Operators have the option to sync copies of all vessel operating and equipment manuals to their tablets for off-line access. Visit us at Workboat December 1st – 3rd in New Orleans and see the first release of WheelHouse Underway, a tablet application for iOS™, Android™, and Windows™ devices. WheelHouse Underway expands the functionality of WheelHouse, which provides: vessel specifications, documentation, maintenance recommendations, and spare parts guidelines in a cloud-based application. 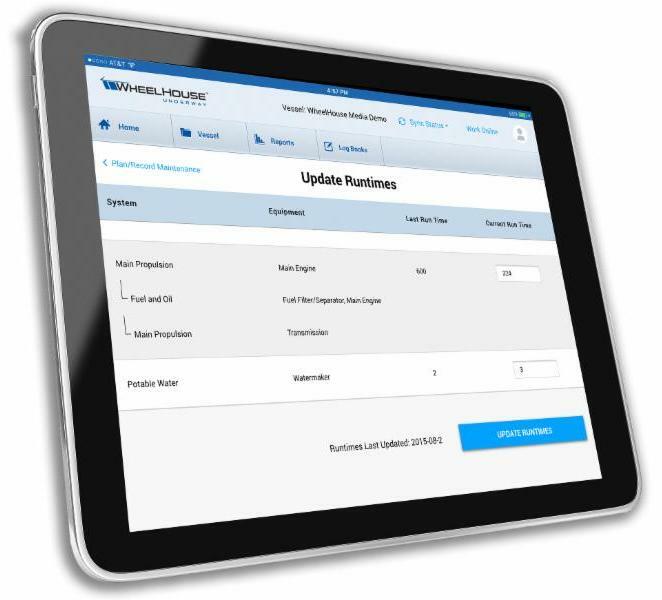 With the official release of WheelHouse Underway, the Off-line offering from WheelHouse Technologies, WheelHouse Yacht Solutions Customers are able to receive the App at no additional charge, as well as the ability to renew their subscription at the current rate before the 2016 increase. To receive your free copy of WheelHouse Underway and renew your subscription, click the link below to enter your subscription rate and credit card information.